The Attorney General’s (AG) office has drafted a new anti-terrorism bill that would grant exclusive authority to the president to declare groups as terrorist organisations. The 39-page draft defines terrorist organisations as a group of people acting as a whole, which carries out or has the purpose of destroying properties or carrying out acts of brutality. The draft legislation proposes restricting constitutional rights upon arrest for terrorism suspects – including the right to remain silent and access to legal counsel – and criminalises flying overseas to fight in foreign wars. Inciting violence at demonstrations and threatening the country’s independence and sovereignty will be considered acts of terrorism. Other terrorism offences include kidnapping, abduction, hijacking, endangering public health or safety, and damaging important infrastructure. The bill specifies penalties of up to 25 years in jail. Committing any of the offences for the purpose of creating terror among the public or promoting a political or religious ideology will also be a terrorist offence. The bill also authorises the home ministry to carry out extensive surveillance of suspects. Circulating messages or statements of a terrorist organisation is also a crime with a jail sentence of seven to 10 years. A draft of the bill has been shared with the Maldives Police Service and the prosecutor general’s (PG) office. Attorney general Mohamed Anil told CNM today that his office is seeking comments from stakeholders and that the bill will be submitted when parliament returns from recess next month. The bill is likely to pass as the ruling Progressive Party of Maldives and coalition partner Maldives Development Alliance controls a simple majority of the 85-member house. The PG office will have to file charges against a person suspected of terrorism within 15 days and the courts will have to reach a verdict within 30 days. The home minister will meanwhile have powers to apply for a ‘monicon’ (monitoring and control) order to tag, intercept communications and conduct surveillance on terrorism suspects. The minister can seek a monicon order if the suspect commits an act that endangers the community. The minister does not have to inform the suspect and the court is not obliged to summon the suspect before issuing the order. If a monicon order has been issued the police can order the person to live at a selected house if the suspect has multiple residences, restrict travelling and search the person, his home, suspected whereabouts on any time without an additional court order. If the law is passed, the Anti-Terrorism Act of 1990 will be dissolved. Former president Mohamed Nasheed and ex-minister Tholhath Ibrahim were charged under the terrorism law over the military’s detention of a judge in January 2012. The pair were found guilty and sentenced to 13 years and 10 years in prison, respectively, last month. The government has awarded luxury flats at discount prices to Supreme Court judges and four heads of independent bodies including the Anti-Corruption Commission in what it calls an attempt to “ensure their integrity”. However, the opposition has condemned the distribution as a “government effort to enslave independent institutions”. 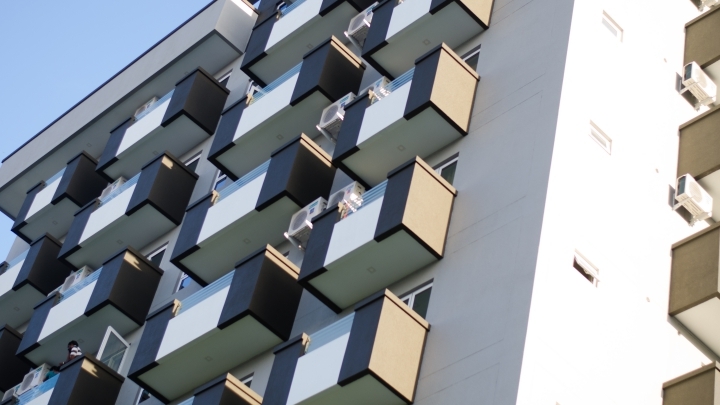 The government was handed 10 flats in the newly built Rehendi Residency, constructed by FW Construction in Male’. The housing ministry then offered the semi-finished apartments for MVR 1.6m (US $103,761), much lower than the market price, to the chosen individuals. Hassan Lutfee, president of the Anti-Corruption Commission, confirmed to Minivan News he had signed a contract to buy one of the apartments at the discounted price. 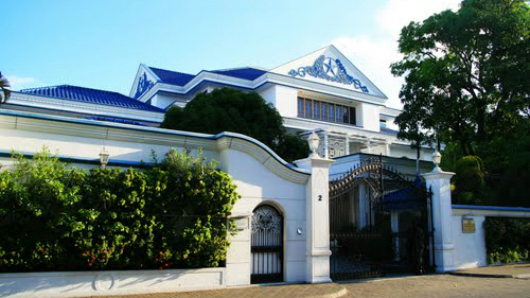 A former owner of one of the apartments not awarded to the government told Haveeru he had bought his apartment for MVR 2m (US $129,000). The government also waived the six per cent interest charged to other flat buyers on their loans, though the prosecutor general said he had requested to pay the normal rate. According to the local media, the flats were awarded to Chief Justice Abdulla Saeed, Supreme Court judges Ahmed Abdulla Didi, Adam Mohamed Abdulla, Abdulla Areef and Ali Hameed, Criminal Court Judge Abdul Bari Yoosuf and Prosecutor General Muhthaz Muhsin. Apartments were also allotted to Commissioner General of Taxation Yazeed Mohamed and Information Commissioner Abdul Azeez Jamal Abu-Bakr. Not all the recipients have yet signed contracts to buy the flats. Co-chair of the Economic Council Ahmed Adeeb told a press conference on Wednesday that the apartments were awarded to “ensure the integrity of independent institutions”. “The flats were not handed out. The recipients have to pay for them. This will result in ensured integrity of independent institutions and moreover it will strengthen the state,” he said. However, the opposition parties accused the government of trying to “enslave” the judiciary and independent institutions. “This clearly is corruption. The constitution clearly states that no benefits can be given to members of independent institutions without parliament’s approval,” said MP Ali Hussain of the opposition Jumhoory Party. Article 102 of the constitution states that members of the judiciary and independent commissions “shall be paid such salary and allowances as determined by the People’s Majlis [parliament]”. However, parliament was not involved in allotting the apartments. Muhathaz, the prosecutor general, told Minivan News he does not think the awards involve corruption. “In my opinion the awarding of the flats is not unconstitutional. But I personally believe that it would have been better if it was awarded to the prosecutor general and not to me,” he said. Information Commissioner Jamal said the flats were given to help the judges and institution heads live in a secure building, and dismissed any idea of government influence. “I assure the people that I will always act professionally and within the bounds of the constitution and the laws,” he said. The prosecutor general receives a monthly salary and allowances of MVR 57,500 (US $3,741), while the anti-corruption commission chief receives MVR 45,000 (US $2,927). Supreme court justices are paid MVR 71,000 ($4,619) and the chief justice MVR 73,125 ($4,757). They also receive extra benefits such as insurance. A majority of civil servants are paid less than MVR 5,000 (US $325) a month. The Supreme Court declined to comment on the issue, while the Housing Ministry refused to give information beyond what was discussed in the Economic Council press conference. Judge Bari and Taxation Commissioner Yazeed were unavailable for comment at the time of going to press. State prosecutors are preparing to charge 14 women and one man who protested at Male’s international airport earlier last month over the arrest and trial of former president Mohamed Nasheed. Police have sent the cases to the prosecutor general’s office to send them to trial, an official confirmed to Minivan News. Another source confirmed that 15 cases were sent to the prosecutor general’s office, while a total of 90 protest-related cases have been sent to the state prosecutor. 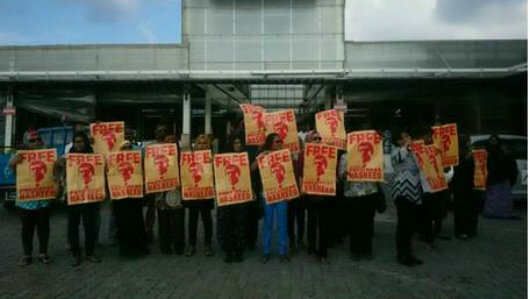 Some 14 women and one man were arrested on March 5 while protesting at the airport with posters calling for Nasheed’s release. The protest was co-ordinated by the women’s wing of the opposition Maldivian Democratic Party (MDP). The opposition has been holding nightly street protests over Nasheed’s trial, but it is rare for demonstrations to take place at the airport in view of international tourists. A police spokesperson at the time said the Freedom of Assembly Act bars protests at airports. Nasheed has since been sentenced to 13 years of prison over terrorism charges, in a trial which was deemed unfair by the UN and Amnesty International. Among those arrested were Malé City deputy-mayor Shifa Mohamed and MDP women’s wing vice-president Shaneez “Thanie” Saeed. Speaking to Minivan News today, Shifa said she is yet to be officially informed of the charges, but have heard rumors about it in the media. “We are already getting punished for protesting. [We] are barred from protesting for 60 days. If they accuse us again we are getting punished for the same crime twice,” Shifa said. All of those arrested at the airport were released by the criminal court at their remand hearing on the condition they do not participate in further protests for 60 days. The opposition has argued that the release of those arrested at protests on these conditions violates their rights to freedom of expression and assembly. Shifa accused the criminal court of misconduct and bias in their treatment of those arrested at protests. The remand trial of those arrested at the airport was headed by Judge Abdul Bari Yoosuf – one of the three-judge panel who sentenced Nasheed to 13 years. The deputy mayor said that Bari warned them he would sentence them to two months in detention if they participate in more protests. “I see this as threat to scare us, and something done to selectively eliminate certain individuals,” Shifa said. 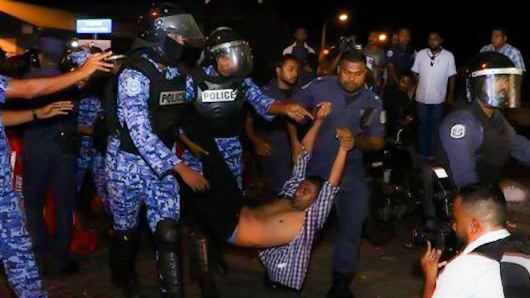 In another high-profile case, MP Ahmed Mahloof, formerly of the ruling Progressive Party of Maldives, was arrested at a protest last week and detained for five days. When his detention ended, the criminal court handed him a further five days of house arrest after he refused the court’s condition to stay away from protests for 60 days. Global MPs’ group Parliamentarians for Global Action has condemned the detention without charge of MP Ahmed Mahloof and called upon authorities to immediately release him from house arrest. 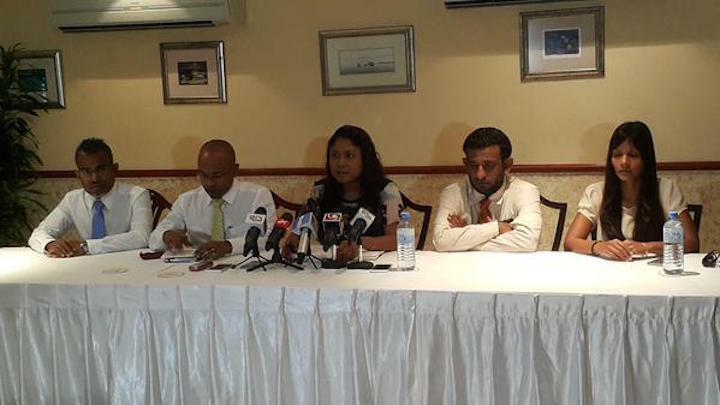 Parliamentarians for Global Action (PGA) expressed its “undiminished solidarity” towards MP Mahloof in a statement today. Noting that Mahloof may have been “targeted” by police for his criticism of the government, PGA expressed concern that freedom of speech, freedom of expression and the constitutional rights of MPs may have been violated. After five days at the Dhoonidhoo detention centre, Mahloof refused to accept the court’s conditional release, which would have barred him from protesting for 60 days. The criminal court then placed him under five days of house arrest. Mahloof was expelled from the ruling Progressive Party of Maldives after its disciplinary committee said he brought President Abdulla Yameen into disrepute with false statements in the media. Meanwhile, a letter from the Prosecutor General’s office was leaked to Minivan News, which arguesthat some recent decisions by the court may have limited individuals’ rights relating to pre-trial detention. The letter, addressed to Criminal Court Chief Judge Abdulla Mohamed, said the decisions limited rights under Article 49 of the constitution. This article says that no one shall be detained prior to sentencing unless there is a fear of the accused failing to appear at court, for the protection of public safety, or to prevent the accused interfering with witnesses. Local media have interpreted the letter, dated yesterday, as a warning to the criminal court over the conditional release of people arrested at protests, which often stipulates they must not go to any more demonstrations for 60 days. Previously, MP Fayyaz Ismail, of the opposition Maldivian Democratic Party (MDP), was detained for 15 days after he refused to accept release on these conditions following his arrest at a protest on March 8. At the time, the Criminal Court had released 33 of the 77 individuals arrested at protests, on the condition they would not participate in further protests for 60 days. “This is not a limitation of rights, but a violation of [the detainee’s] rights to assembly, expression, and free will,” said Shahindha Ismail, executive director of Maldivian Democracy Network’s, earlier this month. Courts can enforce conditions on detainees to ensure a person’s attendance at hearings, for example having to obtain a permit from the court when travelling, but they cannot place a condition asking the individual not to go to a protest, she said. The government has started implementing stronger measures in the crackdown against opposition protests, which escalated after the arrest of former President Mohamed Nasheed on February 22. President Abdulla Yameen today ratified an amendment to the Civil Service Act which bars civil servants from holding posts in political parties and taking part in political activities. The amendment comes at a time where several state owned companies have been accused of firing opposition supporters for participating in anti-government protests. Since March 1, at least four employees of State Electric Company Limited and one from Malé Water and Sewerage Company were dismissed, and at least five were suspended from Maldives Ports Limited. The Maldives will “emerge victorious over adversarial states,” President Abdulla Yameen has declared, slamming alleged foreign interference in domestic affairs following the conviction of former President Mohamed Nasheed on terrorism charges. Addressing supporters at a Progressive Party of Maldives (PPM) rally last night, President Yameen reiterated that exercising authority over either the Prosecutor General or the judiciary would threaten constitutional separation of powers. “God willing, God Almighty will grant us just rulers. And God will grant our state the courage to remain steadfast in Islam and the guidance of Islam. And God willing, we will emerge victorious over adversarial states,” Yameen concluded his remarks by saying. President Yameen’s remarks follow international concern over the lack of due process in the rushed trial of the opposition leader. Nasheed was found guilty of ordering the military to “forcibly abduct” Criminal Court Chief Judge Abdulla Mohamed in January 2012 and sentenced to 13 years in prison. The UN High Commissioner for Human Rights Zeid Ra’ad Al Hussein and the UN Special Rapporteur on Independence of Lawyers and Judges Gabriela Knaul last week urged the Maldives to guarantee that Nasheed’s appeal would respect the most stringent fair trial and due process standards. Cases were tried through independent courts and sentences were implemented after an appeal process, he added. Trials should be conducted swiftly to ensure justice, he continued, claiming that terrorism cases involving up to 1,500 defendants were completed in 48 hours in England. “We don’t go criticising the mechanisms there. And we don’t request getting into the courtrooms there,” he said. 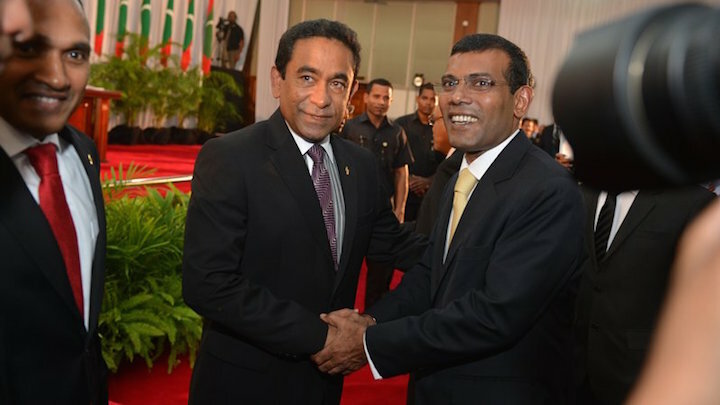 By calling on the president to release Nasheed, Yameen said both the opposition and foreign parties were inviting the president to commit an “impeachable offence”. The president was not responsible for either the PG’s decision to prosecute or the court’s verdict, he said. Exercising oversight over the PG was the task of parliament’s Independent Institutions Committee, he continued, questioning why opposition MPs have not summoned the PG so far. 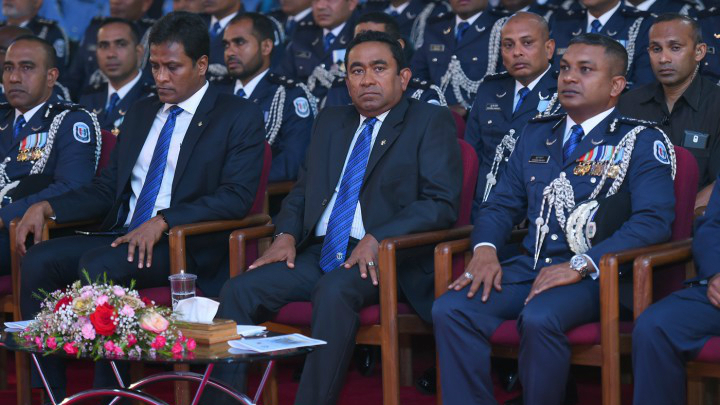 The president ordering the PG not to prosecute or withdraw charges in a specific case would amount to “obstruction of justice” and violation of the constitution, Yameen said.